Whitney formed Los Racketeeros in 1980, a live unit which played blues and bluegrass music. 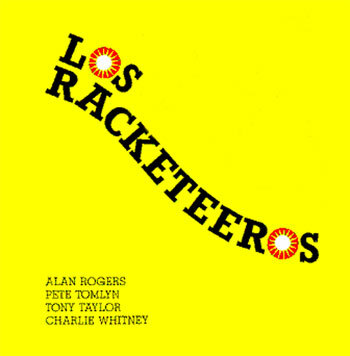 Los Racketeeros recorded a debut album in 1995 with a lineup including Alan Rogers, Pete Tomlyn, and Tony Taylor. Gypsy Girl – Whitney/Taylor/Rogers, What’s That Sound – Em Marks/Whitney/Taylor, Burlesque – WhitneyChapman. All songs published by Almajopeg Music except Burlesque – EMI Music. A crowded bar down a hot dusty street in Andalucia. A crescent moon hanging low over the sea, the night alive with cicadas and music. Charlie Whitney and Tony Taylor were rockin’ that joint good! And then they were off. From the South Pacific to Bodieve; from Lugabruga to Jackson, Tennessee those boys picked and howled. Now at last they’ve found a recording studio and they’ve cut some of their songs. Songs about Cleopatra and rain and Memphis ladies and politicians, and the Burlesque Club. For within this discus are the guitarings and singing of that Family man Charlie Whitney, lover of good wine, women and lap slide; Tony Taylor, alias Captain Video, songwriter and banjo picker; Alan ‘Skunk’ Rogers, drummer and nurseryman and Pete Tomlyn, the walking folk and jazz archive, on double bass. These are Los Racketeeros – a passionate bunch who still believe. A wise man once told me that the blues meets bluegrass and more wherever Los Racketeeros play. I told him it was true because I was there that night 16 years ago and some good things never change.